The LSE project leaflet is available in English, Greek, Denmark, Slovenian and French. The alarming lack of basic skills across Europe, indicated by PIAAC survey, along with the need of skills diversification among the increasing number of newcomers to Europe has highlighted the urgent need for the adoption of a comprehensive approach to learning. Providing adequate and appropriate courses for the above mentioned target group does not only mean allowing them to escape from the low skills trap, but also to empower them to contribute to their own lives, families and communities. Non–formal adult education can and should be the driver of this change by embracing the vision of life skills. The concept of life skills exceeds the basic skills concept, since it promotes more than just a basis for survival. In some countries, adult education providers have already started initiatives to broaden the concept of basic skills and have adopted more holistic practices in basic skills provision. The first intellectual output of the LSE is threefold. Life skills are a constituent part of capabilities for life and work in a particular social, cultural and environmental context. The types of life skills emerge as a response to the needs of the individual in real life situations. 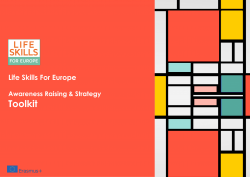 The second part is a comprehensive analysis, which provides an overview of the understandings of life skills in Europe and beyond as well as a collection of good practices and innovative tools already used in the partner countries and a presentation of the main findings of the project’s research. A short 10 page summary is available in English, Greek, Danish, Slovenian and French. The third part is a database of good practices and tools, which is available here. Tools are a variety of didactic accessories that can be used within teaching and learning approaches. This includes multimedia tools such as videos, computer games and applications, as well as literacy and sports activities, real-life materials, handcraft and other workshops, etc. This collection of innovative tools represents relevant examples of tools that contribute to the development of life skills. The instrument for collection included several sections, which provide valuable information and ideas about the tools for potential users and also for analytical purposes. Special emphasis in the instrument was also placed on the description of applicability and the main benefits of the tools for learners, where the description is supported when possible by authentic quotations, photos, videos and products of adult learners. To whom they are addressing to? This selection of tools is designed to be of immediate use for informal learning providers and can be used as a basis for the development of further tools. The collection could also be used as a guideline for further research (i.e. on common transversal principles to be used in the EU for renovating adult education in the area of life skills) and as a concrete and immediately usable database of applicable and transferable ideas. Are you an adult learning provider yourself? Want to test new tools or enrich and further expand your current practice? Check out the database below. Good practices for developing life skills were defined as examples of teaching and learning approaches that contribute to the development of life skills. Examples of good practices can be educational programs, specially developed learning and teaching didactics or methods, curricula, methodological instruments, etc. Special emphasis in the instrument was also placed on the description of innovative characteristics and the main benefits of good practice for learners, where the description is supported when possible by authentic quotations, photos, videos and products of adult learners. The potential of transferability and the universal character of good practice were also included in the instrument. The LSE partnership collected cases of good practices, which are presented in more detail on the database below. 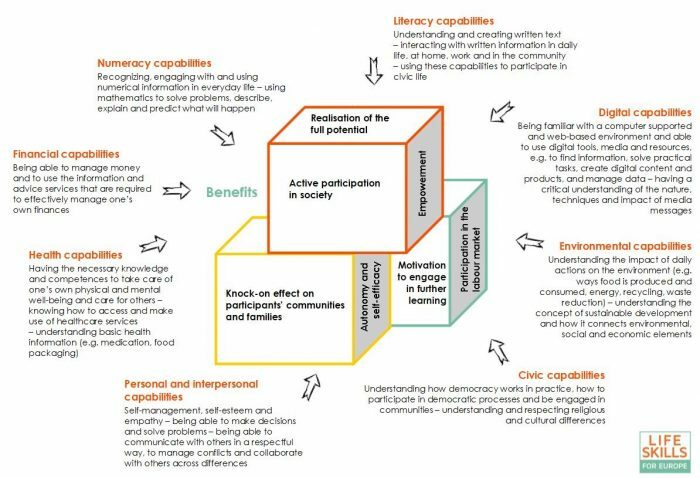 The framework aims to establish a common understanding of life skills by defining eight key types of capabilities necessary to be an active participant in life and work. 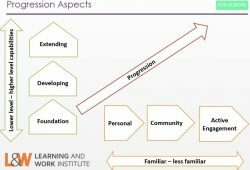 For each capability there are two aspects, difficulty of skill/capability level and familiarity of context, which allow for a range of starting points and support the recognition of learners’ progression. The framework is available in English, Slovenian, Danish, French and Greek. In order to raise awareness of the difficulties that many adults face when it comes to poor life skills, the LSE consortium put together an awareness raising kit that addresses a number of target groups. The LSE consortium brings together 5 organisations from as many countries. The LSE project is coordinated by EAEA – the European Association for the Education of Adults. EAEA is a European NGO with around 141 member organisations in 45 countries working in the field of adult learning. DAEA is a branch organization for 34 Danish member organizations which are all operating on a countrywide basis. All its members represent non-formal or informal adult learning and participatory democracy (‘folkeoplysning’). L&W is a new independent policy and research organisation dedicated to lifelong learning, full employment and inclusion. They bring together over 90 years of combined history and heritage from the ‘National Institute of Adult Continuing Education’ and the ‘Centre for Economic & Social Inclusion’. DAFNI KEK basically plans and implements actions and learning activities targeting to social disadvantaged population and groups at risk (unemployed, single mothers, rural habitants, migrants and Roma) responding to the Official Calls either in National and European Level or in local area by organizing workshops on active consciousness. SIAE is the main national institution for research and development, quality and education, guidance and validation, and promotional and informative activities in the field of adult education since 1991. This project has been funded with support from the European Commission (Erasmus+ programme – KA2 Strategic Partnerships for adult education).